Yesterday, this question posted within the AP Calculus Community about implicit derivatives. Below, I argue why the derivatives MUST be the same, show how four different variations can all be shown to give the same derivative, and provide a final conclusion. 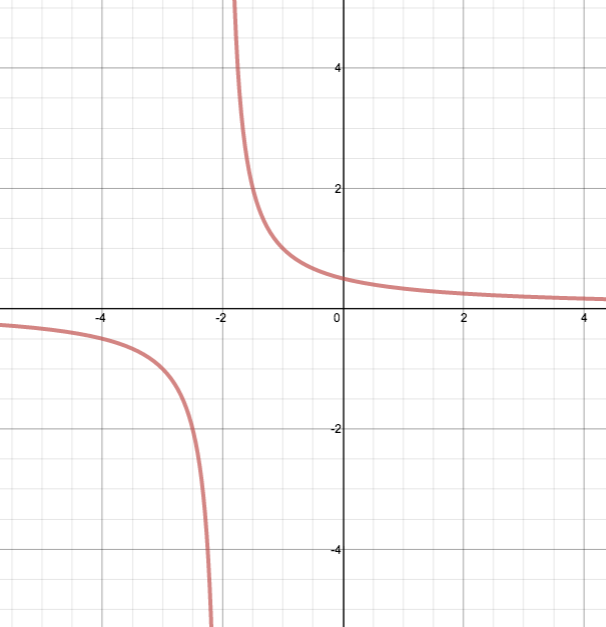 The Desmos graph of the given relation, is , is shown below. Logically, it seems that even when the terms of the relation are algebraically rearranged, the graph should be invariant. The other two forms mentioned in the Community post are on lines 2 and 3. Lines 4, 5, and 6 show three other variations. Here is the link to my Desmos graph allowing you to change between the forms to visually confirm the graphical invariance intuition. If calculus “works”, it also shouldn’t matter how one calculates a derivative. While the forms of the derivative certainly could LOOK different, because any point on the invariant graph has the same tangent line no matter what the form of its equation, and the derivative of a relation at a point is the slope of that invariant tangent line, then the derivative also MUST be invariant. To show the derivatives are fundamentally all the same (as suspected by the initial post), I calculate the derivatives of the equations on lines 1 and 3 given in the initial post as well as my variations on lines 4 and 6. This version is more complicated, requiring the Product Rule in addition to the earlier Chain and Quotient Rules. In the penultimate line, I used the original equation to substitute for to transform the derivative into the same form as line 1. This time, differentiation requires only the Chain and Product Rules. After the usual substitution for , I multiplied both sides by to clear the denominator and solved for , returning the same result. This time, the relation is solved for x, resulting in a much more complicated Quotient+Chain Rule calculation, but substituting for and changing the form leads once again to the same answer. Hopefully this is convincing evidence that all derivative forms can be shown to be equivalent. 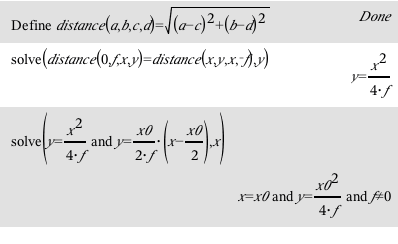 If you’re still learning implicit differentiation, I encourage you to show the derivatives from the lines 2 and 5 variations are also equivalent. So which approach is “best”? In my opinion, it all depends on your personal comfort with algebraic manipulations. Some prefer to just take a derivative from the given form of . I avoid the more complicated quotient rule whenever I can, so the variation from line 4 would have been my approach. The cool part is that it doesn’t matter what approach you use, so long as your algebraic manipulations are sound. You don’t have to accept the form in which a problem is given; CHANGE IT to a form that works for you! 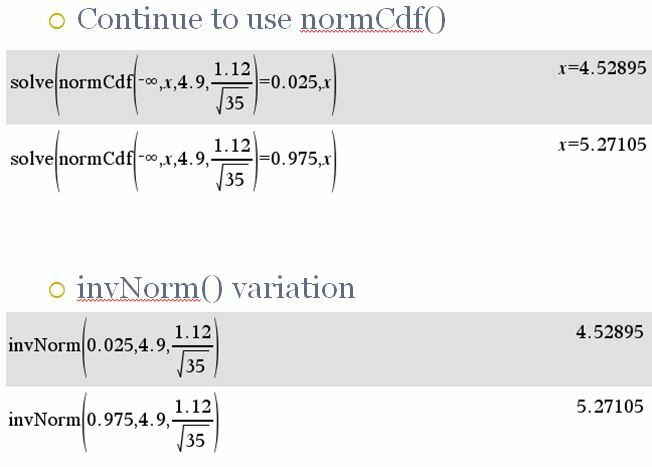 A recent post in the AP Calculus Community expressed some confusion about different ways to compute at (0,4) for the function . I share below the two approaches suggested in the original post, proffer two more, and a slightly more in-depth activity I’ve used in my calculus classes for years. I conclude with an alternative to derivatives of inverses. 1 – Accept the function as posed and differentiate implicitly. 2 – Solve for y and differentiate explicitly. Evaluating this at (x,y)=(0,4) gives . The numeric manipulations on the right side are obviously easier than the earlier algebra. 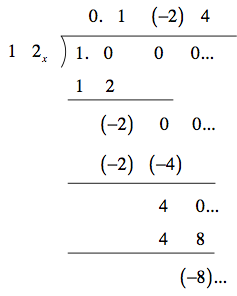 4 – Solve for and reciprocate. There’s nothing sacred about solving for directly. Why not compute the derivative of the inverse and reciprocate at the end? Differentiating first with respect to y eventually leads to the same solution. But it is critical for students to recognize that proper application of manipulations creates equivalent expressions, even if when the resulting expressions don’t look the same. The reason we manipulate mathematical objects is to discover features about the object in one form that may not be immediately obvious in another. For the function , the slope at (0,4) must be the same, no matter how that slope is calculated. If you get a different looking answer while using correct manipulations, the final answers must be equivalent. using implicit differentiation on the quotient, manipulating to a product before using implicit differentiation, and finally solving for y in terms of x to use an explicit derivative. Those 3 forms of the derivative look VERY DIFFERENT. Assuming no errors in the algebra, they MUST be equivalent because they are nothing more than the same derivative of different forms of the same function, and a function’s rate of change doesn’t vary just because you alter the look of its algebraic representation. Substituting the y-as-a-function-of-x equation from method 3 into the first two derivative forms converts all three into functions of x. Lots of by-hand algebra or a quick check on a CAS establishes the suspected equivalence. Here’s my TI-Nspire CAS check. Here’s the form of this investigation I gave my students. I’m not a big fan of memorizing anything without a VERY GOOD reason. My teachers telling me to do so never held much weight for me. I memorized as little as possible and used that information as long as I could until a scenario arose to convince me to memorize more. One thing I managed to avoid almost completely were the annoying derivative formulas for inverse trig functions. For example, find the derivative of at . Since arc-trig functions annoy me, I always rewrite them. Taking sine of both sides and then differentiating with respect to x gives. I could rewrite this equation to give , a perfectly reasonable form of the derivative, albeit as a less-common expression in terms of y. But I don’t even do that unnecessary algebra. From the original function, , and I substitute that immediately after the differentiation step to give a much cleaner numeric route to my answer. And this is the same result as plugging into the memorized version form of the derivative of arcsine. If you like memorizing, go ahead, but my mind remains more nimble and less cluttered. One final equivalent approach would have been differentiating with respect to y and reciprocating at the end. There are MANY ways to compute derivatives. For any problem or scenario, use the one that makes sense or is computationally easiest for YOU. If your resulting algebra is correct, you know you have a correct answer, even if it looks different. Be strong! OK, my Halloween “costume” at school this year was pretty lame, but I actually did put a minute amount of thought into it. In case you can’t read the sign, it says . If you remember some calculus and treat ice as your variable, that works out to –An Ice Cube! Ha! But it gets better. 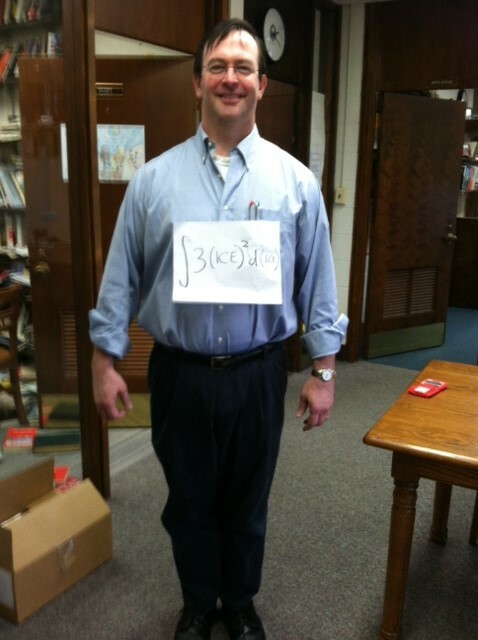 As there weren’t any bounds, adding the random constant of integration makes it or “Ice Cube + C”, or maybe “Ice Cube + Sea”–I was really dressed up as an Iceberg. Ha! Ha! Having no idea how to dress like an iceberg, I wore a light blue shirt for the part of the iceberg above the water and dark blue pants for the part below the water. I tried to be clever even if the underlying joke was just “punny”. Then a colleague posted another integral joke I’d seen sometime before. It has some lovely extensions, so I’ll share that, too. At first glance, it’s a “log cabin.” Funny. But notationally, the result is actually , so the environmentalists out there will appreciate that the answer is really a “natural log cabin.” Even funnier. The most correct solution is . If you call the end “+ Sea”, then the most clever answer is that is a “Houseboat”. Ha! Hope you all had some fun. All along the line, place additional dots 0.5 to 1 inch apart. Finally, draw a point F between 0.5 and 2 inches from the line roughly along the midline of the paper toward the center of the paper. Fold the paper over so one of the dots on line is on tope of point F. Crease the paper along the fold and open the paper back up. Repeat step 4 for every dot you drew in step 2. All of the creases from steps 4 & 5 outline a curve. Trace that curve to see a parabola. I’d seen and done this before, I had too passively trusted that the procedure must have been true just because the resulting curve “looked like a parabola.” I read the proof some time ago, but I consumed it too quickly and didn’t remember it when I was read the above procedure. I shamefully admitted to myself that I was doing exactly what we insist our students NEVER do–blindly accepting a “truth” based on its appearance. So I spent part of that afternoon thinking about how to understand completely what was going on here. What follows is the chronological redevelopment of my chain of reasoning for this activity, hopefully showing others that the prettiest explanations rarely occur without effort, time, and refinement. At the end of this post, I offer what I think is an even smoother version of the activity, freed from some of what I consider overly structured instructions above. 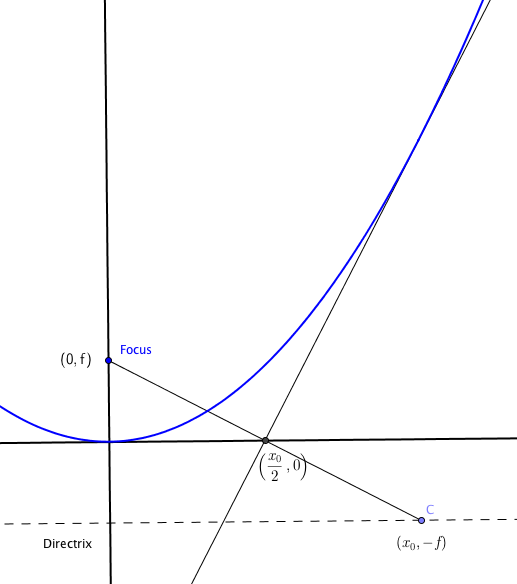 A parabola is the locus of points equidistant from a given point (focus) and line (directrix). 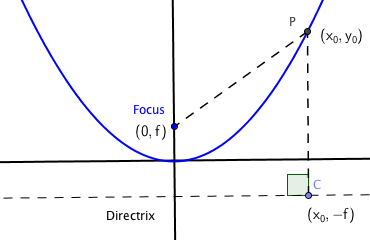 What makes the parabola interesting, in my opinion, is the interplay between the distance from a line (always perpendicular to some point C on the directrix) and the focus point (theoretically could point in any direction like a radius from a circle center). What initially bothered me about the paper folding approach last week was that it focused entirely on perpendicular bisectors of the Focus-to-C segment (using the image above). It was not immediately obvious to me at all that perpendicular bisectors of the Focus-to-C segment were 100% logically equivalent to the parabola’s definition. I think I had two major advantages approaching this. I knew without a doubt that all parabolas are similar (there is a one-to-one mapping between every single point on any parabola and every single point on any other parabola), so I didn’t need to prove lots of cases. Instead, I focused on the simplest version of a parabola (from my perspective), knowing that whatever I proved from that example was true for all parabolas. I am quite comfortable with my algebra, geometry, and technology skills. Being able to wield a wide range of powerful exploration tools means I’m rarely intimidated by problems–even those I don’t initially understand. I have the patience to persevere through lots of data and explorations until I find patterns and eventually solutions. I love to understand ideas from multiple perspectives, so I rarely quit with my initial solution. Perseverance helps me re-phrase ideas and exploring them from alternative perspectives until I find prettier ways of understanding. In my opinion, it is precisely this willingness to play, persevere, and explore that formalized education is broadly failing to instill in students and teachers. “What if?” is the most brilliant question, and the one we sadly forget to ask often enough. While I’m comfortable handling math in almost any representation, my mind most often jumps to algebraic perspectives first. My first inclination was a coordinate proof. PROOF 1: As all parabolas are similar, it was enough to use a single, upward facing parabola with its vertex at the origin. 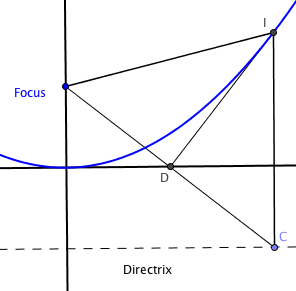 I placed the focus at , making the directrix the line . If any point on the parabola was , then a point C on the directrix was at . But the construction above made lines (creases) on the perpendicular bisector of the focus-to-C segment. This segment has midpoint and slope , so an equation for its perpendicular bisector is . Finding the point of intersection of the perpendicular bisector with the parabola involves solving a system of equations. Proof 2: All of this could have been brilliantly handled on a CAS to save time and avoid the manipulations. Notice that the y-coordinate of the final solution line is the same from above. I had a proof, but the algebra seemed more than necessary. Surely there was a cleaner approach. 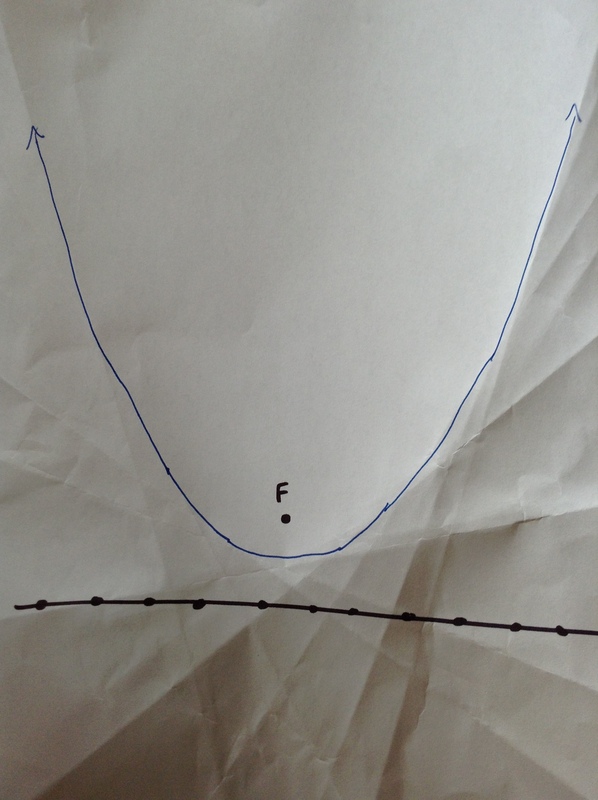 In the image above, F is the focus, and I is a point on the parabola. If D is the midpoint of , can I conclude , proving that the perpendicular bisector of always intersects the parabola? Admittedly, Proof 4 ultimately relies on the results of Proof 3, but the higher-level isosceles connection felt much more elegant. I was satisfied. Thinking how I could prompt students along this path, I first considered a trace on the perpendicular lines from the initial procedure above (actually tangent lines to the parabola) using to trace the parabolas. A video is below, and the Geogebra file is here. It is a lovely approach, and I particularly love the way the parabola appears as a digital form of “string art.” Still, I think it requires some additional thinking for users to believe the approach really does adhere to the parabola’s definition. I created a second version allowing users to set the location of the focus on the positive y-axis and using a slider to determine the distances and constructs the parabola through the definition of the parabola. [In the GeoGebra worksheet (here), you can turn on the hidden circle and lines to see how I constructed it.] A video shows the symmetric points traced out as you drag the distance slider. Throughout this process, I realized that the location and spacing of the initial points on the directrix was irrelevant. Creating the software versions of the problem helped me realize that if I could fold a point on the directrix to the focus, why not reverse the process and fold F to the directrix? In fact, I could fold the paper so that F touched anywhere on the directrix and it would work. So, here is the simplest version I could develop for the paper version. Use a straightedge and a Sharpie or thin marker to draw a line near the edge of a piece of paper. Place a point F roughly above the middle of the line toward the center of the paper. Fold the paper over so point F is on the line from step 1 and crease the paper along the fold. Open the paper back up and repeat step 3 several more times with F touching other parts of the step 1 line. All of the creases from steps 3 & 4 outline a curve. Trace that curve to see a parabola. This procedure works because you can fold the focus onto the directrix anywhere you like and the resulting crease will be tangent to the parabola defined by the directrix and focus. 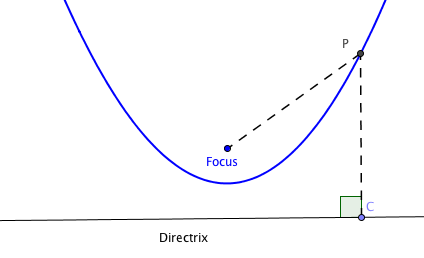 By allowing the focus to “Travel along the Directrix”, you create the parabola’s locus. Quite elegant, I thought. As I was playing with the different ways to create the parabola and thinking about the interplay between the two distances in the parabola’s definition, I wondered about the potential positions of the distance segments. What is the shortest length of segment CP and where could it be located at that length? What is the longest length of segment CP and where could it be located at that length? Obviously, point C can be anywhere along the directrix. While the focus-to-P segment is theoretically free to rotate in any direction, the parabola definition makes that seem not practically possible. So, through what size angle is the focus-to-P segment practically able to rotate? Assuming a horizontal directrix, what is the maximum slope the focus-to-P segment can achieve? Can you develop a single solution to questions 2 and 3 that doesn’t require any computations or constructions? I fully realize that none of this is new mathematics, but I enjoyed the walk through pure mathematics and the enjoyment of developing ever simpler and more elegant solutions to the problem. In the end, I now have a deeper and richer understanding of parabolas, and that was certainly worth the journey. Doug Kuhlman recently posted a great follow-up Numberphile video explaining a broader perspective behind this sum. It’s a great reminder that there are often different ways of thinking about problems, and sometimes we have to abandon tradition to discover deeper, more elegant connections. For those deeply bothered by this summation result, the second video contains a lovely analogy to the “reality” of . From one perspective, it is absolutely not acceptable to do something like square roots of negative numbers. But by finding a way to conceptualize what such a thing would mean, we gain a far richer understanding of the very real numbers that forbade in the first place as well as opening the doors to stunning mathematics far beyond the limitations of real numbers. On the face of it, is obviously wrong within the context of real numbers only. But the strange thing in physics and the Zeta function and other places is that just happens to work … every time. Let’s not dismiss this out of hand. It gives our students the wrong idea about mathematics, discovery, and learning. There’s very clearly SOMETHING going on here. It’s time to explore and learn something deeper. And until then, we can revel in the awe of manipulations that logically shouldn’t work, but somehow they do. May all of our students feel the awe of mathematical and scientific discovery. And until the connections and understanding are firmly established, I hope we all can embrace the spirit, boldness, and fearless of Euler.